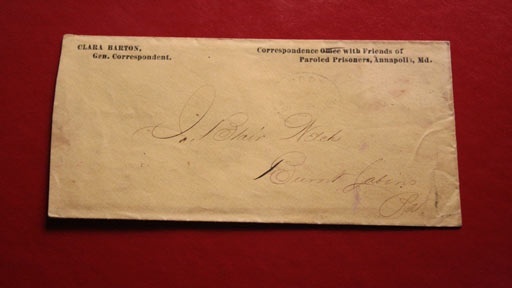 Tucked into the pages of an antique book, our contributor from Osceola, Indiana found what he thinks may be a letter written by Clara Barton, founder of the American Red Cross. Dated July 1866, the letter reports the death of a man named Israel Brown. Along with the letter, our contributor found an envelope addressed to J. Blair Welch, Burnt Cabins, Pennsylvania. Did Clara Barton actually write this letter? If so, why was she writing about these men? History Detectives consults a Clara Barton biographer, a civil war prison historian, and a Pennsylvania genealogist. Note: In the Clara Barton Letter story that was broadcast we mistakenly showed a map of Osceola, Illinios instead of Osceola, Indiana. We are working to correct the error in later airings. Also in Civil War: 1850-1877 Civil War Sabotage? The steamship Sultana exploded one night in 1865, killing more than 1,800 people. Was the disaster a result of Civil War sabotage? Also in Season 9 Ronald McDonald Costume Is this the costume that helped serve up a billion Happy Meals? Also in Civil War: 1850-1877 Confederate Eyeglass Is this how southern sympathizers identified each other during the Civil War? Also in Season 8 Transatlantic Cable How did this twisted fragment of metal spark a communications revolution?